It illustrates a pitchfork bifurcation as a slice through a cusp catastrophe. 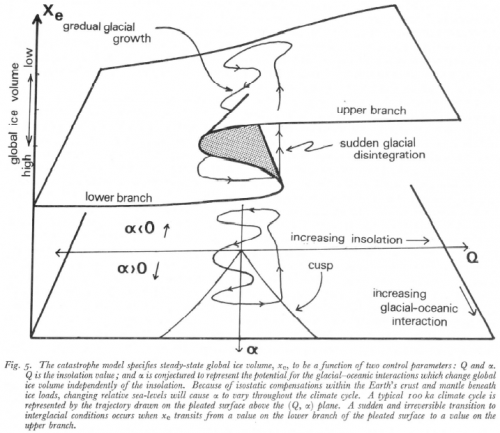 It’s conceptually related to earlier models by Budyko and Weertmans that demonstrated hysteresis in temperature and ice sheet dynamics. The model is used qualitatively in the paper. I’ve assigned units of measure and parameter values that reveal the behavior of the catastrophe, but there’s no guarantee that they are physically realistic. The .vpm package includes several .cin (changes) files that reproduce interesting tests on the model. The model runs in PLE, but you may want to use the Model Reader to access the .cin files in SyntheSim.